The infection starts with Frank, one of the locals at the town bar. In just a few hours, it has consumed the entire town. Dan Lowery, one of only four police officers in St. Matthews, soon realizes he is no match for the impending destruction. Violence and bloodshed litter the streets, and the infected roam freely. No one is safe here—not even his family. Somewhere, someone knows what is happening, and about the horrors to come…but is it too late? 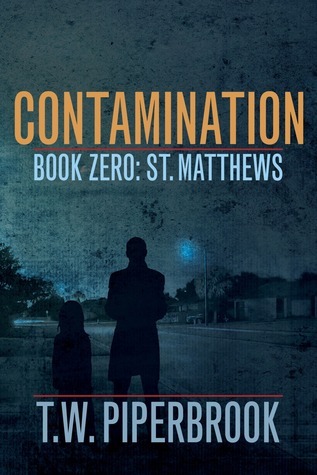 Contamination: St. Matthews takes you right to the onset of a mysterious Zombielike virus being unleashed on a small town. The story starts in a rural sheriff's office somewhere in the middle of Arizona. The town drunk Frank has been locked up again and the sole cop on duty Dan is left to deal with him. From the moment Frank is introduced I knew he was a dead man walking and I was fine with that. Every good Zombie story needs a patient zero. However it's what happens after Frank is killed that the book takes an odd turn. Enter cop #2 Howard. At first I assumed Dan and Howard would end up together with a town overrun by newly turned Zombies. Nope, Dan instead goes home where he finds his wife in a near catatonic state clutching a knife. When his wife "turns" and attacks him Dan calls on Howard to help. From that point on I felt like I was reading a completely separate book. Howard it turns out is a sleeper agent whose perfectly OK with murdering a town full of people. Dan seems to lose his backbone and spends way to long trying to reason with his wife. He's a cop, why he never busted out the cuffs to try and restrain her is beyond me. Then you have Dan's daughter running around and constantly finding herself in run ins with the turned townsfolk. To be quite honest the book was a hot mess. Had it been established some conspiracy was brewing from the onset Howard's personality turn wouldn't have felt so jarring. The way it happened felt instead like a cheesy plot device to give the book a bad guy. I also had no emotional attachment to Dan's daughter. She seemed like a brat and by the end I was rooting for her demise. Sadly, that was not to be. Overall, I can see the potential in Contamination but I'm not sure if potential is enough to make me want to continue with this series. That being said, I will be rating Contamination by T.W. Piperbrook ★★★.